Too dark for science and too evil for theology, but some secrets refuse to stay hidden. Postgraduate student Harry Chesterton uncovers a trail of dark science that leads to the old monastery above the Welsh town of Aberystwyth. With bodies beneath the cafe, residents oozing puss from puncture marks on their necks, and the disappearance of the University Chaplain, Chesterton's research into post-mortem consciousness is about to leap off the page. The Memoirs of Harry Chesterton were found by the author in an attic flat in Eastbourne along with Chesterton's final letter before crossing over into the world of Thanatos. 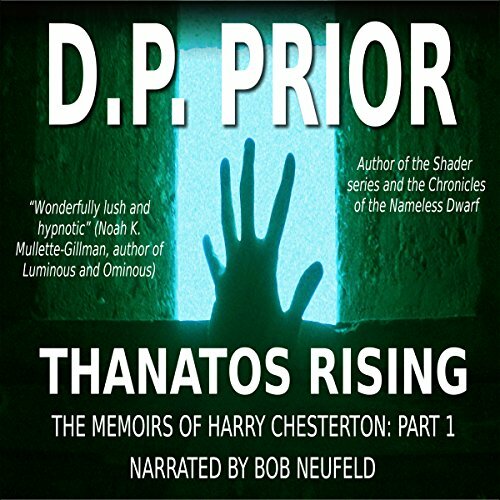 Thanatos Rising constitutes the first volume of memoirs which recounts Chesterton's perilous investigations in Aberystwyth up until the time of his first disappearance. Too dark for science and too evil for theology, but some secrets refuse to stay hidden. Postgraduate student Harry Chesterton uncovers a trail of dark science that leads to the old monastery above the Welsh town of Aberystwyth. With bodies beneath the cafe, residents oozing puss from puncture marks on their necks, and the disappearance of the University Chaplain, Chesterton's research into post-mortem consciousness is about to leap off the page.